I hope you all had a wonderful Thanksgiving! 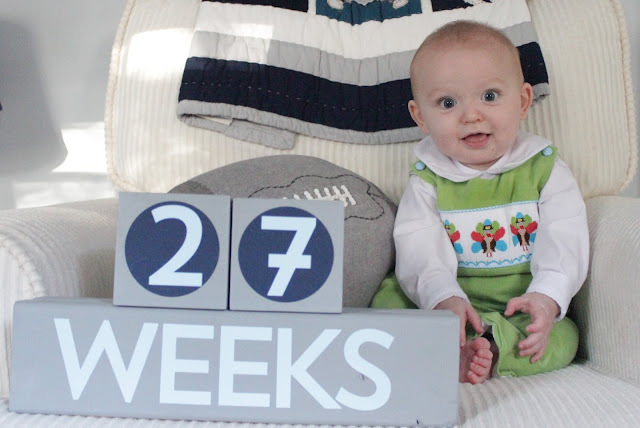 This big guy turned 27 weeks on Thanksgiving, so here's a little catch-up on our lives during the pre-Thanksgiving craziness! Lulu got to come to the dentist with me last Thursday! Of course he was a perfect angel (no, seriously!) and all of the people at our dentist's office loved him! When we came home, I attempted to do a little Christmas photo shoot! 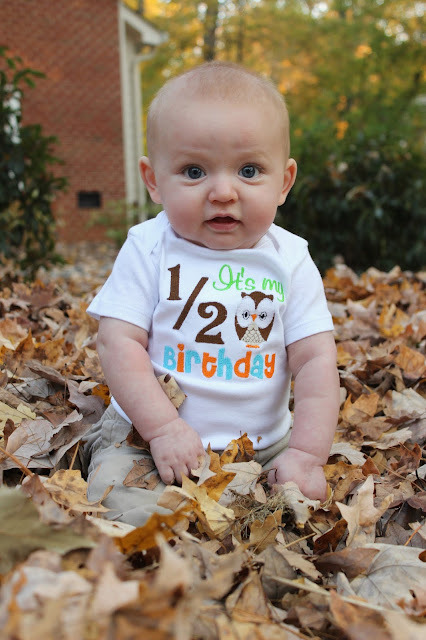 On Saturday (Lucas's official half birthday) we celebrated in Chapel Hill! He got to meet the real Rameses!! He was so excited (Ella too)!! The leaves were so pretty this time of year in Chapel Hill! We did a LOT of walking that day, but I didn't mind since it was so gorgeous out! Then it was game time! UNC was playing The Citadel, and it ended up being a pretty big blowout. By the time Ella and I walked back to our seats, the temperature had dropped like 20 degrees! It was insanely windy! 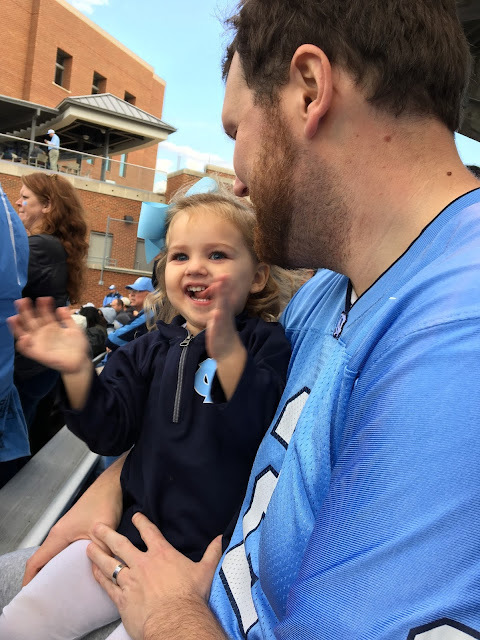 Thankfully UNC had a big enough lead that Trav was okay with leaving at halftime! ...and I also tried to make a half birthday cake for him. I have no clue where I went wrong, but it was SUCH a disaster! The cake turned out super crumbly and wouldn't hold any frosting on it whatsoever. Sorry, Lulu...maybe Mommy will try again when you're 18 months and can actually eat the cake! Ella just started reading her Clifford book to Lucas! It was the sweetest thing. Last Tuesday, we were in full-blown Thanksgiving prep mode! Lucas sat up top in the shopping cart for the first time! And Ella came home from preschool that day with the most hilarious art! 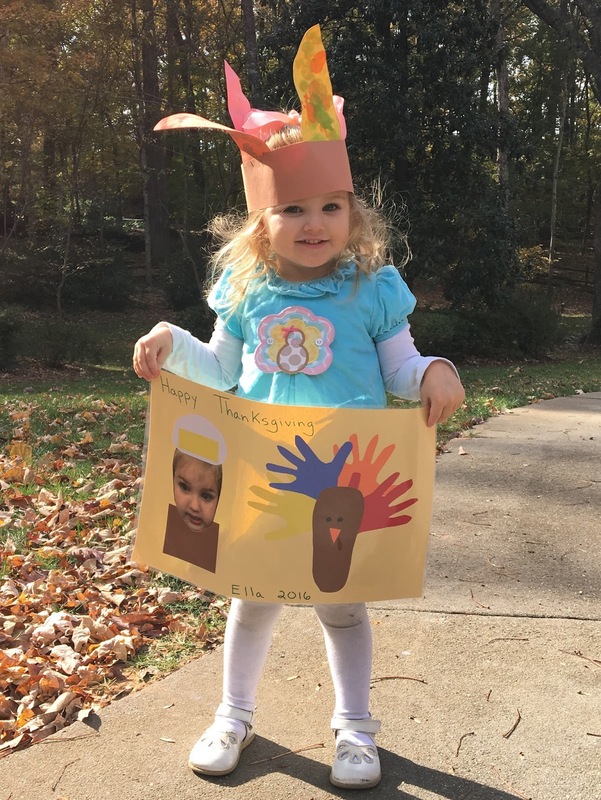 I especially love her big pilgrim head on that placemat! That evening, I was nursing Lucas before he went to sleep, when I noticed on Instagram, a baby who looked way too similar to Lucas had died. I was so heartbroken! I had been following along with his story, because he was the same age as Lucas (less than a week younger) and he was just the cutest thing! 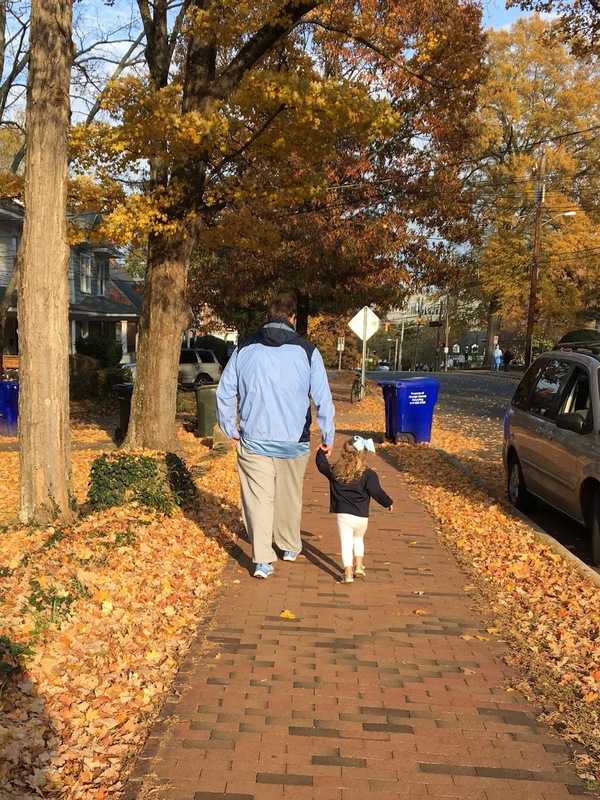 If you'd like to read about his/his family's story, here is his mom's blog. I just had to snuggle extra with this guy and enjoy those sweet moments when he should be sleeping, but instead is looking at me from his crib with his big eyes! This is his new thing: look as cute as possible so I won't make him go to sleep! Precious boy! Wednesday: coffee was so necessary! Ella is loving our new shopping cart arrangement, where she gets to be in the big part with all of the stuff we are buying! We also had to stock up on wine at Trader Joe's! Wednesday night, we went to the Panthers' tree lighting with Auntie Caitlin! Lucas looks like he is not a fan...but I promise, he was really into the lights!!! I'll be back soon to share our Thanksgiving!